Our Mailbox Reflective Numbers are 911 compliant. We have shipped thousands to municipal government to implement the 911 program. The numbers are made of 3M Scotchlite Reflective Material. They are printed using screen process printing sometimes called "silk screen." We use the highest quality vinyl screen ink. 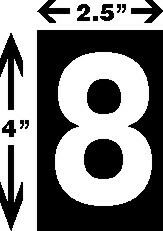 911 reflective numbers are required by law to be visible to law enforcement and emergency response personnel. Our numbers have been specifically designed to conform to these standards. The numbers come with a black background and reflective number. The self-adhesive backing enable anyone to apply their address number to any color mailbox. We use 3M 3200 Engineer Grade Scotchlite for long outdoor life. If you purchase online please put the number you want in the "CUSTOM INFORMATION" box after clicking the GO TO PAYMENTS button. Or Just call 800-582-1554 and say you want the "Home Owner Special deal. Be ready to give your credit card number and expiration date (Mastercard, Visa or Discover) and a shipping address. If you want an aluminum sign with your number on it, we can send one to you (postage paid) for $20. The sign will be 4" tall by whatever length determined by the number. 4 holes will be drilled in the corners unless specified otherwise.